RPA-W7EX reproduces extremely realistic sound as if you are at a live of recording. A large amount of information, high musical resolution, and natural resonance contribute to bring you actual "Real Sound”. You can hear the rich texture of the saxophone in jazz, minute expressions in the orchestra, and the lyrical tone of the violin. RPA-W7EX reproduces a lot of natural tonal characteristics and minute signals by converging two technologies, "Audio class switching power supply" and "CLASS D". As we try to get as close to live sound, the amount of information is a critical factor. These technologies drive speakers with greater speed and control precisely against counter-electromotive forces. (Please refer to “TECHNOLOGY” tab in this site) You can hear all of tones in the content. Some people may have negative impressions of "CLASS D" or switching power supply. This is likely because we didn't have good devices about 10 years ago. It was difficult to switch large amounts of current quickly and accurately. Today’s switching technology has been vastly improved. Additionally, SPEC CORP. has been developing parts for optimal switching circuits. Now we can easily enjoy the benefits of switching technology. Additionally SPEC CORP. proposes a principled approach for the Power Amplifier. Built-in volume control devise controlled by a control signal which makes it possible to reproduce very small signal untouched. PURE DIRECT CONNECTION can make the input level of Power Amplifier large as same as output level of source device. Conventional method must lower the input level to a very low level because the Power Amplifier has a very high gain. This is a counterproductive method because very low level signal transmissions are subject to noise and some of detail will disappear. With this large level transmission, RPA-W7EX can amplify extraordinarily small signals. You can hear absolutely all of the tones within the content. You can materialize this connection using SPEC PRE-AMP “RPA-P7EX” or tiny box “H-VC1” which simply generates volume control signal. At the beginning, you can enjoy the RPA-W7EX by connection above. Next, SPEC CORP. recommends Bi-amping connection using one more RPA-W7EX. 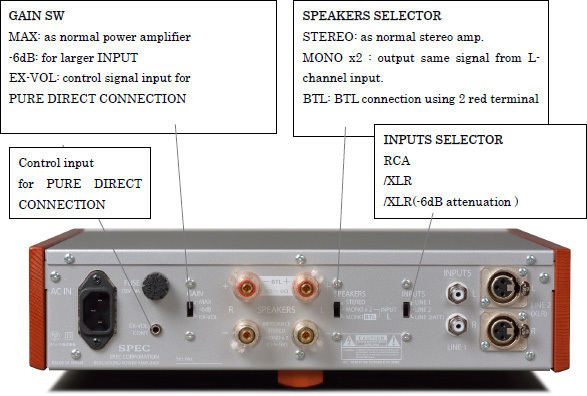 This connection can prevent mutual the influence of counter-electromotive force between woofer and tweeter therefore the amplifier can drive speakers more directly and accurately. So the sound will turn out to be most real and lifelike. Additionally, you can enjoy BTL connection instead of Bi-amping. By this method you can enjoy the most powerful sound. HIBIKI-ICHI was developed with the goal of rapid response and natural tone by world renowned capacitor maker "NICHICON". SPEC CORP. took part in the development, and this is used in "Audio grade switching power supply ".You can see the JAPANESE KANJI on the surface of capacitor. This KANJI is pronounced as "HIBIKI-ICHI" and means vibrancy. 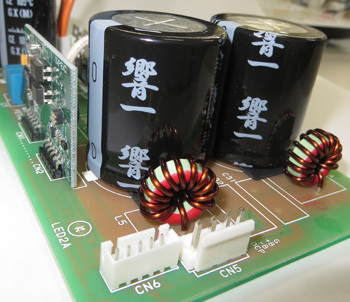 You can see specially designed toroidal coil for the Audio Grade Switching Power Supply. If you have some questions , please feel free to contact us by e-mail as follows.